After he is resurrected, Dean burrows his first change of clothes from Bobby. That includes this long-necked grey-brown Henley. Its buttons run from collar to sternum. Dean puts in on in Lazarus Rising (4x01), after he’s convinced Bobby that he’s not a demon or shifter, and he’s thus gained access to a shower and borrowed fresh clothes. He wears it until he and Bobby track down Sam. 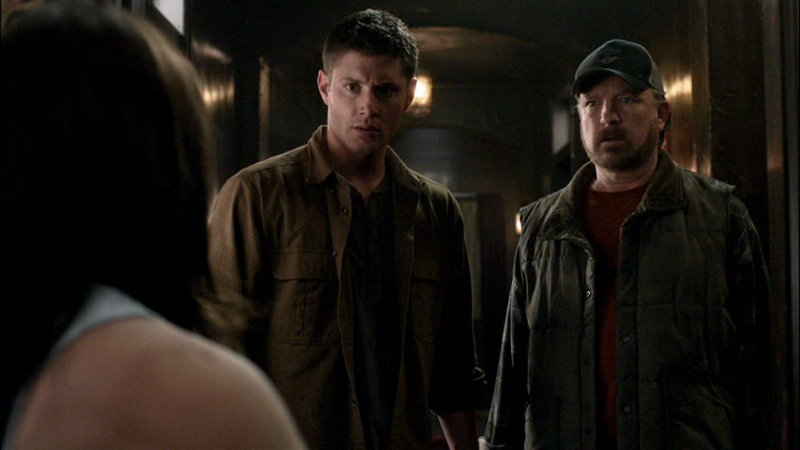 He changes out of it after Bobby leaves to call Pamela and Dean tells Sam that he doesn’t remember Hell. It didn't occur to me the first time I watched either - it was only when I was paying particular attention to the show that I realized they really didn't look like Dean's clothes. And yes, you're right. It's pretty rare for Dean to actually look as tall as he is...but this show does it. Haha, yeah. I like on the S3 Gag reel where Jensen imitates meeting fans: "'You're taller in person' - I get that a lot"
I like to jokingly refer to Supernatural as Vancouver's Tall-People-Employer. :P If you think about it, every time they are going against something "evil" it makes sense for that evil thing to be tall and menacing...and that's pretty hard when one of the leads is 6'4" without shoes on. Back to the shirt: Yes, he's still in the "hunter's uniform', but it's obviously not HIS uniform. It was the colour that really got me. Dean never wears that colour - and heavy layers are one thing, he really does swim in that shirt, and yes, basically the whole style of it is off. When he borrows Sam's shirt/Jacket, they fit him far better in the shoulders, and the only thing that gives them away as still not being his is the fact that A)Dean has never worn a corduroy jacket before, and B)the sleeves are too long. Most of the tall guys I know are tall and bean-pole thin. I know very few who are tall and muscular. Dean usually wears beige - so, yeah, lighter less-orange tans. Other than that, it's blue and greens, and very occasionally plaid...which is another thing that indicated his shirt might be Sam's in Lazarus Rising. Ok, I don't like being THAT person because this resource is FLAWLESS and I've had the BEST time reading it and I'm sure I'm going to use it as a reference a LOT in the future. The amount of time and effort taken to do this whole project is MOMENTOUS and you deserve major major kudos. And I'm glad you appreciate the effort it took to make this clothing record! I'm looking forward to starting posts on S6 soon! If it's not listed under the beige Henley catagory, then I probably decided not to worry about what young-Dean and Sam were wearing when I catalogued this episode... with the exception of the purple plaid shirt, which I know I've listed. I may check later and add it if it's not there.